We Have decided to part with Jay. He is a little over 4 years old. He has also sired several litters. The reason I have decided to part with him is that unfortunately, almost all of his puppies have too much white on them. He has produced some pretty babies though! 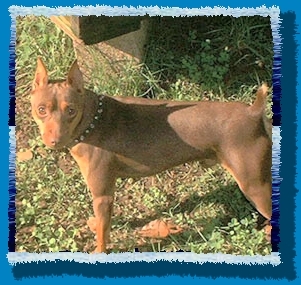 However in trying to maintain and improve on the breed and on my breeding line - I would like to find him a good home. He is housetrained and very playful - but also likes to be held. He can be dominant with other males, but is great with females. He is show quality, however, I have not seen any chocolate ones in the shows. 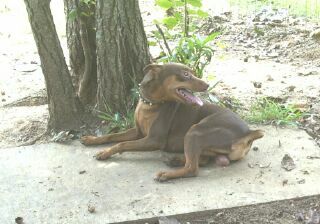 I purchased him from JW Kennels about 2 years ago. He has Champions in his pedigree, which I can send or email to you. He is also DNA certified. He would make a lovely pet, I recommend a fenced yard or a place in the country. He has never been near roads. He is housetrained. Like stated before he is not sick or wore out or anything like that . I just feel that if they aren't going to be bred, they deserve a good home with lots of attention and after being bred it is rather stressful on the to be around all these females! If interested, email me or call 662-423-5690. I am asking $400.00 for him.